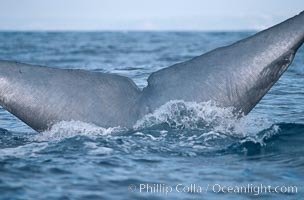 Blue whale, fluke, tail with median notch, lifting tail before diving in the open ocean. To find other photographs that may interest you, use my Image Search to access over 35,000 images available NOW on this site. Or you can review a Stock List of Subjects, Categories and Locations, but be prepared: it is a long list. Note: the online database offers "thumbnail" and "large" versions of each image and video for your review. For security reasons I must limit the number of "large" versions and videos that each visitor is permitted to view. You have viewed 2718 "large" images and/or videos which exceeds the maximum allowed. You are now able to view "thumbnail-sized" images only. If you are serious about reviewing and licensing my photographs, please contact me and I will immediately remove this restriction, enabling you to continue viewing the "large" versions of my images.